Map showing the territories of the Iapygian tribes. The Iapygians (Greek: Ἰάπυγες, Ĭāpyges; Latin: Iapyges, Iapygii) were an Indo-European people who inhabited Apulia in classical antiquity. They lived in the eponymous region Iapygia and were divided in three populations: the Daunians, Peucetians and Messapians. Their land was annexed by the Roman Republic, and they were eventually Latinized and assimilated into Roman culture. The Iapyges have unknown origins but could have been an Illyrian tribe. Illyrian colonization of Italy (IX century BC). They spoke the Messapian language since the Messapians themselves were the southernmost tribe of the Iapyges. Their other tribes included the Daunians and the Peucetians. The name Iapyges is derived from Greek authors, who linked the tribe's origin to Daedalus's son Iapyx. They were called Apuli, Salentini (or Sallentini) and Calabri by Roman authors. Iapygians were akin to the Oenotrians, an ancient Italic people who lived in the territory of Basilicata and Northern Calabria. The genitive forms, -aihi- and -ihi- corresponding to the Sanskrit -asya- and the Greek -oio- , appear to indicate that the dialect belongs to the Indo-European family. 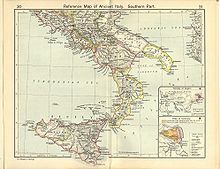 Other indications, such as the use of the aspirated consonants and the avoiding of the letters m and t as terminal sounds, show that the Iapygian dialect was essentially different from the Italian one and corresponds in some respects to the Greek dialects. The supposition of an especially close affinity between the Iapygian nation and the Hellenes finds further support in the frequent occurrence of the names of Greek divinities in the inscriptions and the surprising facility with which the people became Hellenized, presenting a striking contrast to the shyness in the respect of the other Italian Nations. Apulia, which in the time of Timaeus (400 BC) was still described as a barbarous land, had in the sixth century become a province thoroughly Greek, although no direct colonization from Greece had taken place. 19th century German historian Theodor Mommsen believed that the Iapygian people were either the oldest immigrants to, or the historical autochthones of Italy. The Iapygians are mentioned by Polybius as having provided Socii troops for Rome's armies in the wars against Carthage. ^ Outline of Universal History, Volume 1 by George Park Fisher, 2009, page 232, "... now Calabria, and in Apulia, there was another people, the Iapygians, whose origin is not certain, but who were not so far removed..."
^ The student's atlas of classical geography, consisting of fifteen maps, constructed and engraved by Edward Weller ... and descriptive letterpress by Leonhard Schmitz, Michigan Historical Reprint Series, 2005, page 14, "In the south-eastern peninsula we meet with the Iapygians, of unknown origin: Central Italy contained a great number of tribes..."
^ Mommsen, Theodor (1885). The History of Rome. Leipzig: Reimer & Hirsel, Leipzig. This page was last edited on 7 April 2018, at 06:24 (UTC).